In 1903, 13 year-old John Shaw was sent from Sheffield, England to work as a farm labourer in Canada. 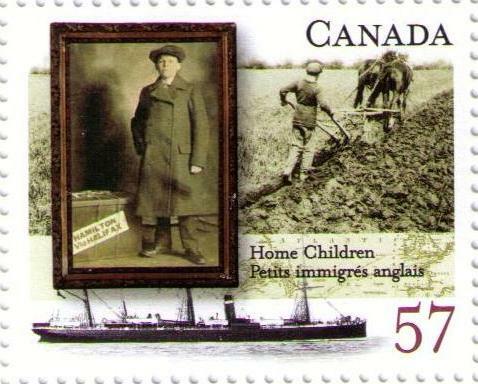 Shaw was one of approximately 100,000 poor children who were shipped to Canada from the United Kingdom by religious and philanthropic organizations from 1869 until the late 1940s under the United Kingdom’s Child Migration Scheme. When they arrived overseas, many of the home children were exploited as cheap agricultural labour and were denied proper shelter and education and were often not allowed to socialize with native children. 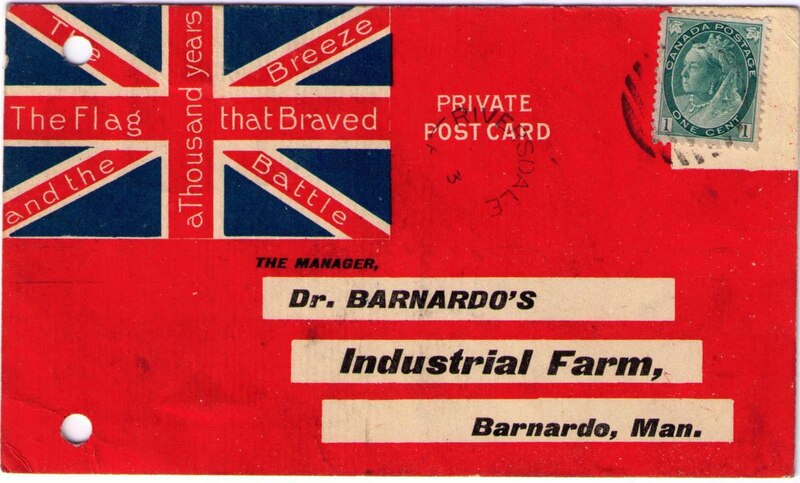 Dr. Barnardo's Homes was the most prominent organization that shipped children out of Britain to Canada and Australia. The organization sent about 30,000 children to Canada between 1882 and 1939. 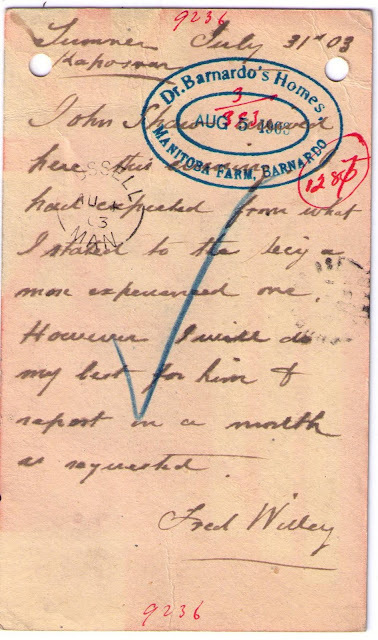 After his initial stay at a receiving home in Ontario, John Shaw was sent to Dr. Barnardo's Industrial Farm for older boys near Russell, Manitoba. The boys lived in a large house on fourteen square miles of land. There was a dormitory that could sleep 200 boys in bunk beds along with a small jail for boys who broke the rules. The boys were taught the basics of farming before being sent to farms in western Canada to work as indentured labourers until the age of 18. 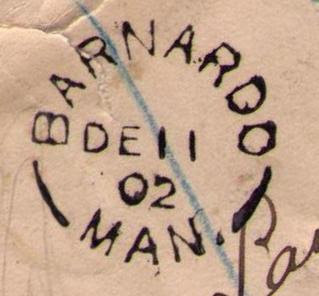 The Barnardo post office was open from November 12, 1896 to August 31, 1906. In July, 1903, John Shaw was sent to Kaposvar, District of Assinaboia (now Saskatchewan) to work at Fred Willey's farm. The patriotic post card shown below was pre-addressed to the "Manager, Dr. Barnardo's Industrial Farm" and used by Mr. Willey to report John Shaw's arrival at his farm. John Shaw arrived here this evening. report in a month as requested. 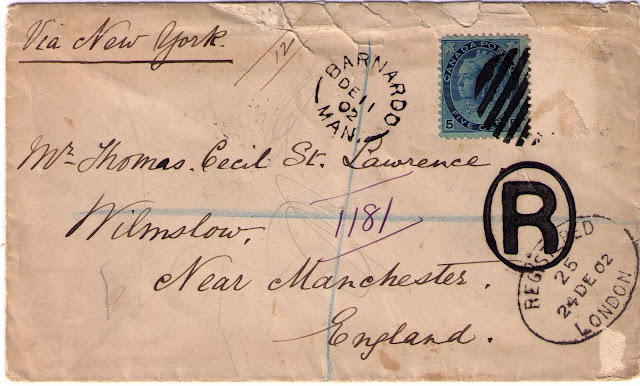 I have checked the records held here and can confirm that John Shaw was admitted to Barnardo's and emigrated to Canada in March 1903. However, as you are not a descendant you are not entitled to apply for a copy of his records. I can tell you that John was born in 1885 and was in the employ of Fred Willey. He stayed in touch with us until 1970 when he was living back in the UK. In 1987, an investigation was carried out in the United Kingdom which led to the exposure of the child migration scheme and the establishment of the Child Migrants Trust. I say today we are truly sorry. They were let down. We are sorry that they were allowed to be sent away at the time when they were most vulnerable. We are sorry that, instead of caring for them, this country turned its back. We are sorry that the voices of these children were not always heard, their cries for help not always heeded. And we are sorry that it has taken so long for this important day to come and for the full and unconditional apology that is justly deserved. Although the Canadian Government chose not to apologize for abuse and exploitation suffered by the Home Children, the Government of Canada designated 2010 as The Year of the British Home Child to "recognize the hardships suffered by British Home Children and their perseverance and courage in overcoming those hardships".